Thanks to Richthofen Fan Steve Miller for sharing this. Who Is This Masked Aviator? It's Someone You Know! Great film at the Steven Spielberg Film and Video Archive of the U.S. Holocaust Memorial Museum. Thanks to subscribers and battlefield traveling mates Jack Kavanagh and Ted Huscher for bringing this to our attention. The July issue of your World War I monthly newsletter, the St. Mihiel Trip-Wire, is now available at the URL above. It is for the dedicated student of the First World War with articles on military operations on the land, sea, and air, personalities of the time, and all the activities associated with the centennial. 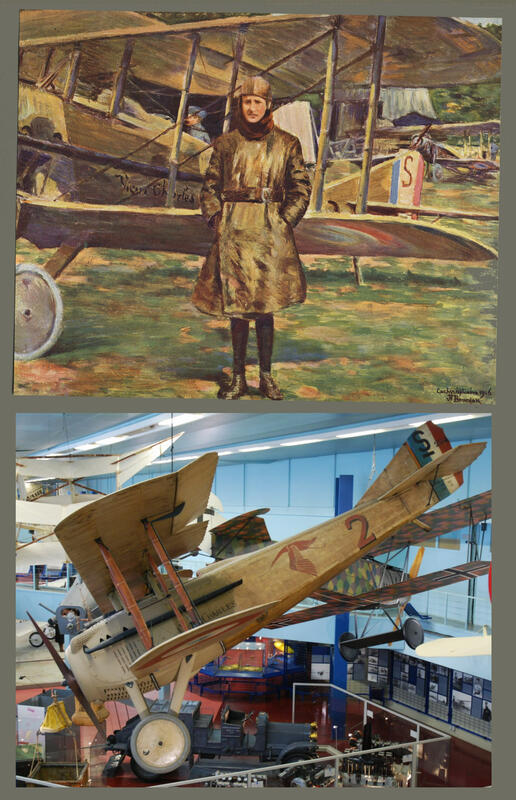 In this month's issue we have features on "Wizards of the Air: the remarkable designers of the Great War's aircraft; the activities of the WWI community and preparations for the centennial; the Second Balkan War; news items, quotes, and recommended books; the forgotten Battle of Riga; the Tirailleurs Sénégalais; and what Marcel Proust and Joe Stalin were up to during the war. 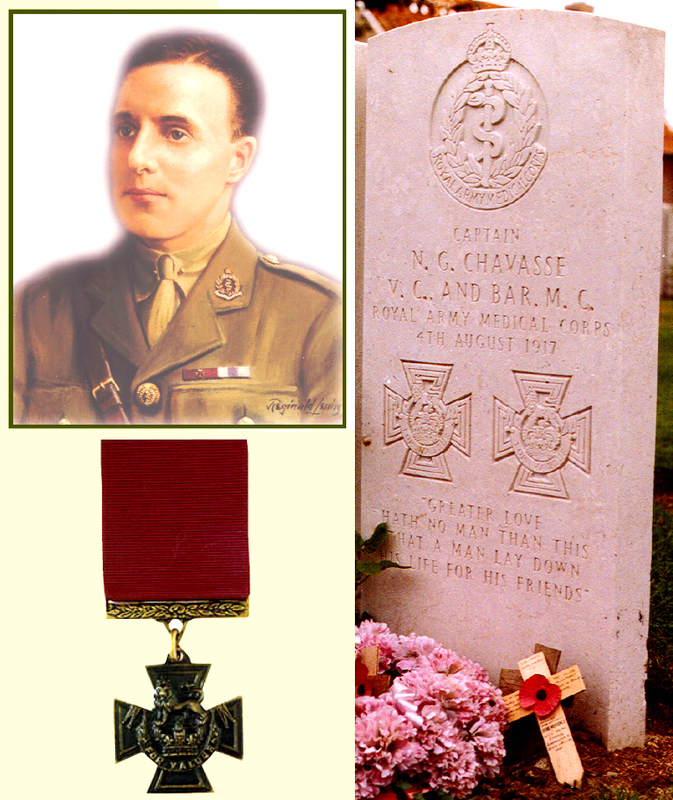 Noel Chavasse was one of identical twins, his brother being called Christopher. They were born on 9 November 1884 in Oxford. They moved with their family a few years later, when their father was made Anglican bishop of Liverpool. The twins were both very good at sports — so good that when they were at university they represented Great Britain in the 400 meters at the 1908 Olympic Games. Noel trained to become a doctor and when war broke out in 1914 served with the Royal Army Medical Corps, attached to the Liverpool Scottish Regiment. Very soon he was sent to France. He tended the wounded in the open all day, under heavy fire, often in view of the enemy. The next night he searched for wounded in front of the enemy's lines for four hours. Next day, with a stretcher-bearer, he carried an urgent case for 500 yards, under heavy fire, into safety and was wounded in the side by a shell splinter. The same night he rescued three wounded men from a shell hole twenty-five yards from the enemy's trench, buried the bodies of two officers and collected many identity discs, although fired on by bombs and machine guns. Altogether he saved the lives of some twenty badly wounded men, as well as taking care of his other patients. His second Victoria Cross was earned in 1917. The regiment was fighting at Passchendaele, in the mud and the constant driving rain that made conditions horrendous beyond belief. Though severely wounded himself whilst rescuing an injured soldier, he refused to leave his post, and for two days, not only continued to perform his duties, but in addition, went out repeatedly under heavy fire to search for and attend to the wounded left on the battlefield. During these searches, although practically without food during this period, exhausted and in severe pain, he helped to carry badly wounded men over heavy and difficult ground. By his extraordinary energy and inspiring example he rescued many wounded who would have otherwise undoubtedly died in the bad weather conditions. The central theme of The Experience of World War I is the gigantic scale of the military effort waged by approximately 70 million men in uniform. Winter’s account answers such questions as “Why did the generals persist in large-scale offensives after the catastrophic losses early in the war?” and “What was the impact of the war on the world economy and European politics?” These are answered by describing the conflict, year by year, as it was experienced by generals, soldiers, politicians, and civilians. A number of secondary topics are also explored, including women’s war poetry, graphic arts, and films of the war. Winter draws on firsthand accounts of life during the war, including diaries and memoirs by both men and women from all countries and from all social groups. The Experience of World War I is copiously illustrated with hundreds of color as well as black and white photographs. It includes color maps, a full chronology of the war and tables of essential data such as the names of wartime politicians and their periods of service. By dividing World War 1 into four phases — 1914, the war of illusions; 1915, stalemate and stagnation; 1916–17, the great slaughter; and 1917–1918, revolution and peace — The Experience of World War 1 provides a clear structure to the exploration of the complexity of the events of 1914–1918, from the bloody battles of Verdun, the Somme, and Passchendaele to the flood of literary and artistic works during and after the war. While Winter acknowledges that the complexity of the war cannot be contained within any simple explanatory framework, The Experience of World War I achieves its primary aim to “highlight the salient features of a conflict which has moved from reality to myth.” Such little known details as the limited period of time, e.g. two weeks out of one month spent by soldiers in the trenches and the amount of food needed to feed five million men in the British army, provide fascinating reading. The Experience of World War I is a worthy forerunner to J.M. 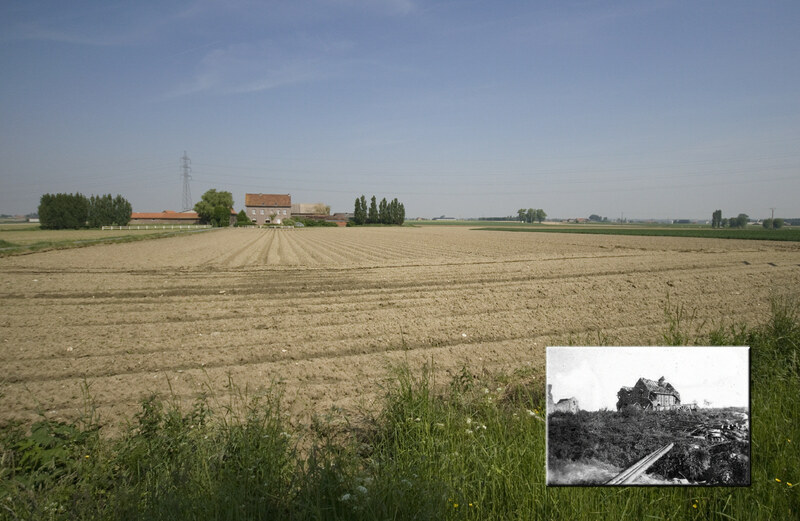 Winter’s more recent works, such as Sites of Memory, Sites of Mourning: The Great War in European Cultural History (1995). le. If you are one of the many new visitors to Roads, please check the archive listing on the right side of the home page. There may material of particular interest to you that we have already published. We don't want you to miss some of our best articles and images. Woods now U.S. Marines entirely! From top: Belleau Wood (Aisne-Marne) Cemetery from the steps of the chapel. Marines Jason Sperry and Stuart Land raising the American flag in the central glade of the woods adjacent to the Marine monument, and drinking from the Devil Dog fountain, Belleau Village, respectively. Belleau Wood after the battle. Battle map on kiosk in the wood. Marine Corps Silent Drill team, Memorial Day Ceremony, 2012. The realist painter George Bellows (1882-1925) produced two of the most famous boxing paintings of American art, Stag Night at Sharkey's and Dempsey and Firpo. Apparently though, despite his familiarity with physical violence, something snapped when Bellows heard the partly true, but sometimes exaggerated, accounts of German atrocities in Belgium. He appears to have decided that German policy was to trample on the Marquess of Queensberry's rules, the Geneva Conventions, and common decency. He produced a series of paintings which are, possibly, grimmer than anything turned out by the various propaganda ministries during the war. 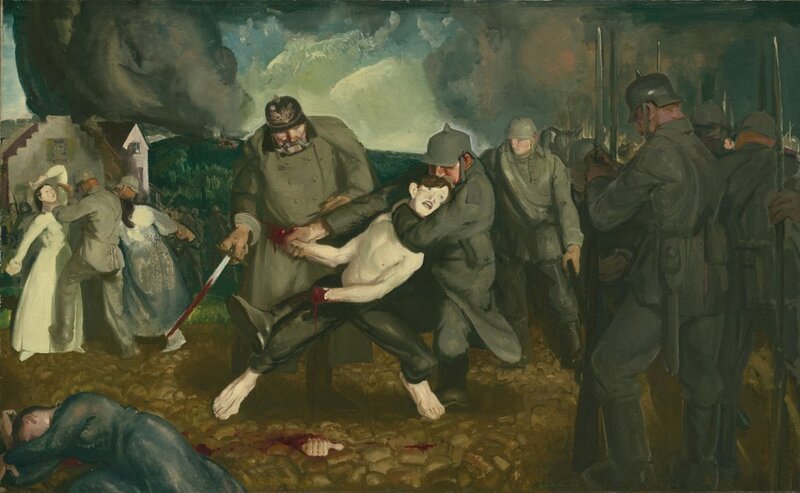 The image above of brutal German soldiers removing both of the young man's hands in the company of swooning ladies and another recently deceased fellow citizen is one of the less ghoulish works in the series. The story of of General von Falkenhayn proposing to the Kaiser to "bleed the French Army white" at Verdun is well known. But, where did he come from? And where did he go? 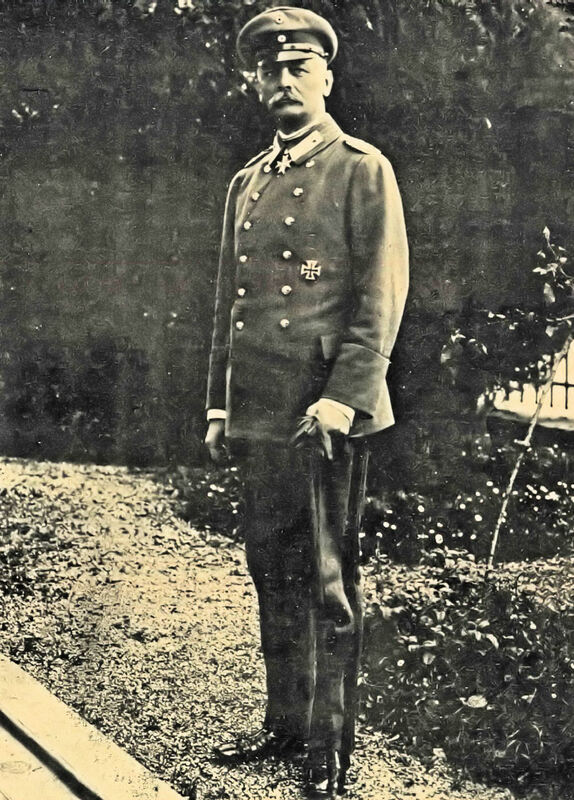 The First Battle of the Marne doomed the German Army to a long war and ended the career of Chief of Staff Helmuth von Moltke the Younger in the fall of 1914. Minister of War Erich Georg Anton Sebastian von Falkenhayn (1861–1922), who would dominate the German military machine through mid-1916, absorbed Moltke's job. Von Falkenhayn had used his unique blend of detached analytical thinking, aloofness, and personal charm to overcome his disadvantageous Bohemian/Austrian ancestry and be perfectly positioned for advance when Moltke fell. A courtier of the first order, his personal magnetism had progressively won him favor from his days as a junior officer, with anti-Bismarckian intriguer Count Waldersee, the Dowager Empress of China, and, later, with both Wilhelm II and his recalcitrant son, the Crown Prince. His resume—including infantry and general staff assignments, plus service in China both as military adviser and with the expeditionary force sent to quell the Boxer Rebellion—gave him a broader background than the typical talented officer in the Prussian Army. 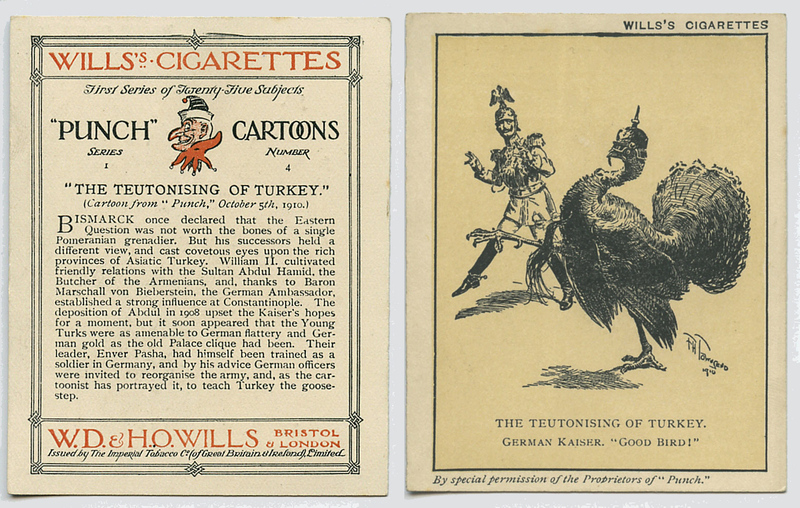 Promotions for him accelerated in 1912 due to his association with Crown Prince Wilhelm. Having been the trusted military tutor to the heir to the throne, Falkenhayn had a champion in the inner circle as war approached. By the summer of 1913 he had risen to the rank of major general and was appointed minister of war for Prussia. Robert Apsrey, better known for his work on Belleau Wood, produced an excellent study of Kaiser's generals in The German High Command at War. Falkenhayn supported war in 1914, and when it came he was the Kaiser's indispensable man, accompanying the emperor on his numerous visits to frontline headquarters. After power came to him, Falkenhayn looked to the east to follow up on the success at Tannenberg. He supported the Hindenburg/Ludendorff team and the combined German-Austrian Gorlice-Tarnow Offensive in the south. But 1915 proved to him that, despite successes, campaigning on the Eastern Front would be long and exhausting and that any decision in 1916 would have to come in the west. He evaluated the Allies in his clinical, scientific way, then drafted his notorious memo to the Kaiser that led to Operation Judgment, the attack on Verdun. Erich von Falkenhayn was deposed in August 1916 when it became evident that as much German as French blood was pouring into the Rivers Meuse and Somme. Given an operational command, he saw substantial success helping dismantle the ill-considered Rumanian war effort. Subsequently, he failed as commander of Turkish forces in Palestine and Egypt, and Lithuania saw his military career effectively end in February 1918. Falkenhayn's later service was anticlimactic, though. His foremost role in history will be as the man who conceived the Battle of Verdun. 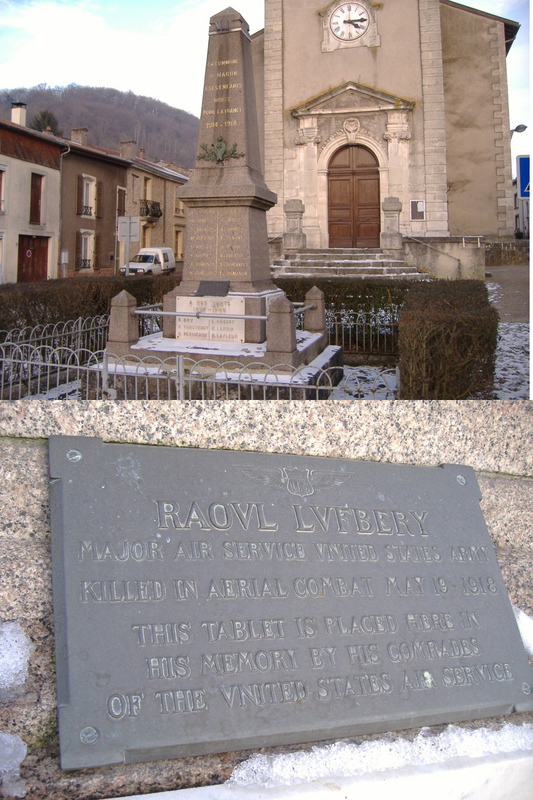 Thanks to reader ML who has uncovered the location of the Raoul Lufbery crash site marker we asked about a few days ago. 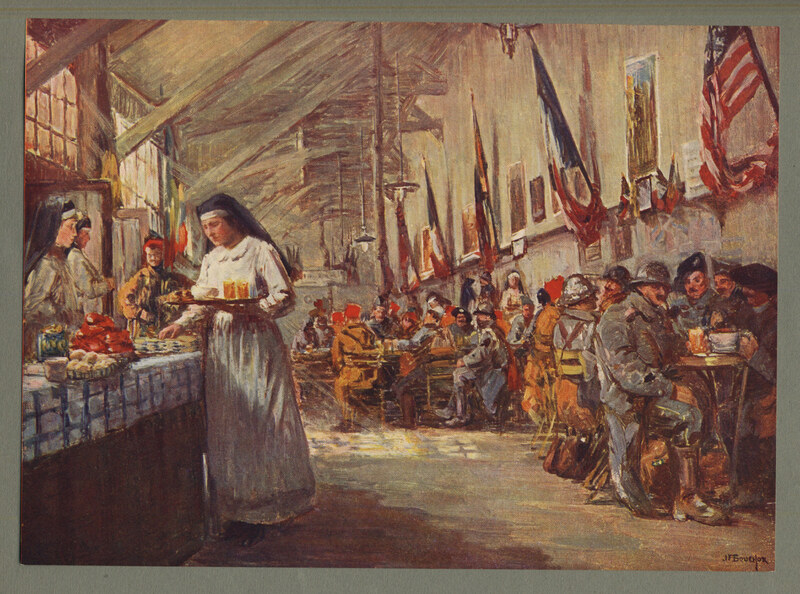 Above are two images from the French language discussion board where ML discovered them. The marker has been relocated from the crash site to the nearby WWI monument of the village of Maron, which is located midway between Toul and Nancy on the Moselle River. Here are three views of the Third Army Memorial at Redipuglia, Italy. In all my visits to the battlefields of the Great War, I found the complex shown here to be the most overwhelming. A comprehensive tour of this site is simply physically exhausting. 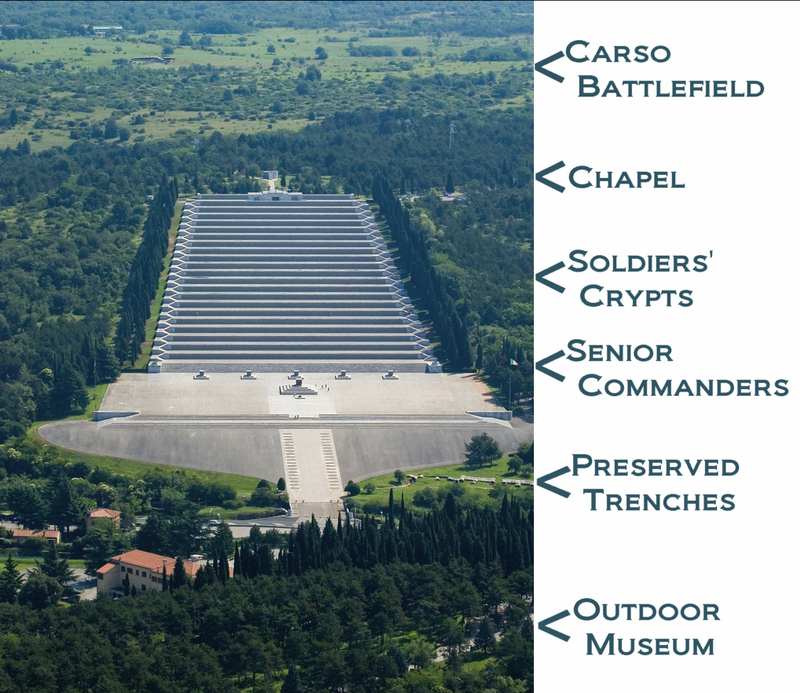 The complex honors the nation's Third Army that bore the brunt of the 11 Isonzo Offensives launched by Supreme Commander Luigi Cadorna between 1915 and the fall of 1917. Third Army gained further distinction by not breaking during the Caporetto disaster of October 1917 and playing a leading role in the final victory offensive a year later. 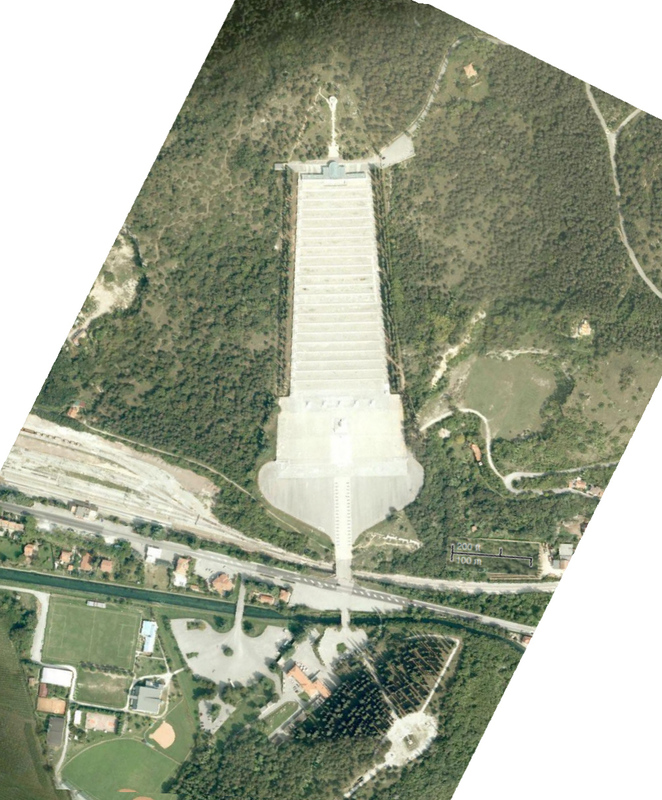 Over 1000 feet long and averaging 400 feet in width, the massive main burial site rises on the southern edge of the Carso Plateau, just inland from the Gulf of Trieste. During the war, the Carso was a grim battlefield, bitterly fought over. Here on monumental terraces are buried the remains of 100,187 fallen: 39,857 known and 60,330 unknown. At the main monument's lowest level stands the impressive resting place of the Duke of Aosta, commander of the Third Army and one of few Italian generals fondly remembered by his troops afterward. The design is intended to the impression of the deployment on the battlefield of a great military force with its leader at its head. The duke, who died in 1931, was laid here in accordance with his wish to lie amongst his soldiers. His grave is covered with a 75-ton monolith of porphyry. From this level begins rising the terrace containing the remains of the 40,000 known soldiers who fell during the war and whose names are inscribed in individual plaques of bronze. On the topmost terrace, in two huge common graves that flank the votive chapel, lie the remains of 60,000 unknown soldiers. At the summit of the monument rise three large bronze crosses, symbols at once of the ultimate sacrifice and of the hope of ascension to God. Behind the votive chapel is a small museum and gift shop and observation deck to view the Carso battlefield. Just to the south lies the Hill of St. Elia, once the site of the old cemetery which was the original war memorial at Redipuglia. The hill has been transformed into a garden of remembrance and outdoor museum. On the main access path are sculptures honoring each branch of the Italian Army. The monument at its top, a simple monument created from the fragment of an ancient Roman column, commemorates the dead of all of Italy's wars. Walkways with military equipment on display lead the visitor to former communication trenches, caves, trenches, and machine gun and mortar positions of the original defense system created by the Austrian forces that stoutly defended the position. Adjacent to the hill is the Third Army House, which contains another excellent museum and restaurant. 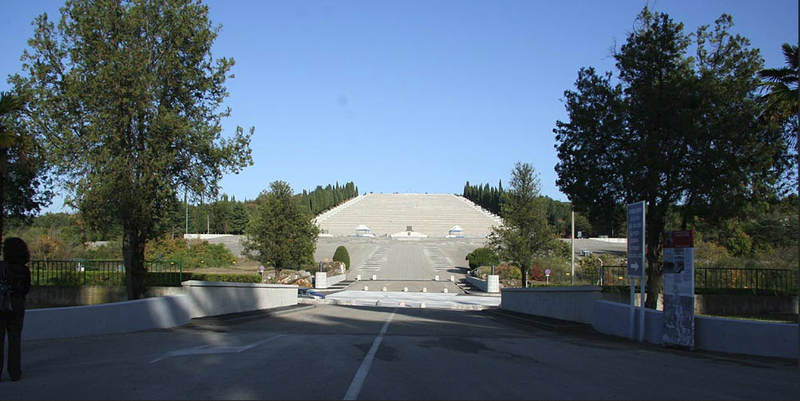 About one km west from Redipuglia is a well-maintained cemetery with the remains of 14,406 Austro-Hungarian soldiers who fell during the war and whose remains have been transferred from a number of graveyards in the area. Sources: Italian Tourism Sites, Google Maps for the overhead view. World War I has left us some real tongue twisters. We have called on our assistant editor, Kimball Worcester, for help with the pronunciations of some of our favorite places, things, and personalities of the war. Referring to Wytschaete, captured by the British recently, a writer in the "Evening Standard" says: A Flemish correspondent kindly supplies me with a phonetic aid to the pronunciation, which I gladly pass on to my readers. In Flemish the name is rendered as if it were "White's Shat" ("a" as in father.) In French the word is pronounced "With's Cat." The name Wytschaete is derived from "Wide-Schoote," a word which means "longshot." ' Never in its history, I suspect, has the place so fully justified its name as it is doing in these days. Our Tommies call Wytschaete "White sheet." Raoul Gervais Lufbery, the third- highest-scoring American ace for World War I, was the first American to reach ace status. He was member of the famed Lafayette Escadrille before transferring to the U.S. Air Service following the nation's entry into the war. He had 17 confirmed victories with the French. He was born in Clermont-Ferrand, France, March 1885, and worked in a chocolate factory in Blois and Clermont-Ferrand until 1904. After that, he traveled the world doing odd jobs along the way. He joined the U.S. Army and served in the Philippines, where he became an expert marksman. During this time he became a U. S. citizen. After serving in the army, Lufbery again started his world travels. In 1912 he went to Calcutta and met the famous French flier Marc Pourpe. Lufbery signed on as Pourpe's mechanic and traveled with him to the Far East. When the war started, Pourpe joined the French Service Aeronautique. Lufbery joined the French Foreign Legion as an infantryman, which would not jeopardize his citizenship. However, he was transferred to join Pourpe's unit to become his mechanic. On 2 Dec 1914, Pourpe was killed as he attempted to land his plane in fog at night. Lufbery decided to follow in Pourpe's footsteps and transferred to the air service to learn to fly. He was assigned to Escadrille V.B. 106 on the Front October 1915. In May 1916 he finished Nieuport school and was assigned to the Escadrille Americaine on 24 May. Part of Lufbery's success could be attributed to the fact that he was a good mechanic. He also hand -loaded his own machine gun rounds into their drums to check for any slight imperfections that might cause his gun to jam. On 30 July 1916 Lufbery got his first confirmed kill, by shooting down a German two seater. After more victories, he was awarded the Medaille Militaire and Croix de Guerre with a Palm. In October Lufbery became an ace by shooting down five aircraft. Americans in the French Aviation Service were of immense value to France. Their greatest contribution was realized in 1918 after most had transferred to the Air Expeditionary Forces. Being combat veterans, they were assigned to newly arrived American units where they could pass their knowledge along to those just entering combat. The story of the transfer of expertise from the Lafayette Escadrille to the U.S. Air Service is told in fascinating detail by Bert Frandsen in his 2003 work, Hat in the Ring: The Story of American Air Power in the Great War. After Lufbery transferred to the AEF, he was reassigned to the U. S. 95th Aero Pursuit Squadron and then the 94th Aero Squadron which had just arrived at the front. As a combat instructor, his job was to train new pilots, including Capt. Eddie Rickenbacker. P.S. : some maintain that cognac or brandy is the kick in the French 75. It's also possible; but gin was a familiar basic for many Americans of the era and having it sent over before the U.S. entered the war was likely manageable. Also remember that champagne + brandy is actually a champagne cocktail. In some respects the First World War provides material for a work that could be titled: The Complete Guidebook on How Not to Do Things. We will revisit some of the war's most colossal blunders periodically in Roads to the Great War. Our first entry was something of a double-barreled disaster. With the failure of the 1917 offensive of the Russian Post-Tsarist Provisional Government, Supreme Commander Alexi Brusilov's stock plummeted and his advocacy of executions to restore discipline in the army made him politically unpalatable to the Provisional Government. He had to go. Alexander Kerensky, now Prime Minister, selected heavy-handed General Lavr Georgevich Kornilov to replace him. On political matters, this would be roughly analogous to George Patton replacing Dwight Eisenhower as Supreme Allied Commander in World War II. It was an appointment doomed from the start. Kornilov's solution for restoring discipline turned out to be even more threatening to the revolutionary cadres than Brusilov's. Kornilov believed it was imperative to repeal Order No. l, issued by the Petrograd Soviet in March 1917, which made all military orders dependent upon its consent and placed discipline at a regimental level under the discretion of soldiers’ councils rather than in the hands of officers. 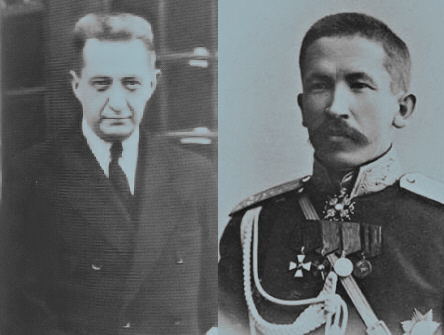 Kerensky simply could never agree to such a fundamental change and an overly-candid speech by Kornilov at a conference in Moscow further alarmed him. He began seeing Kornilov as a Napoleon in the making with backing from the right. Whether imagined or real, charges of a coup were levied when Kornilov sent troops to Petrograd to maintain order. Kornilov responded to the charges by calling for the overthrow of the Provisional Government, sealing his fate. He would be dismissed, jailed, and, after escaping, become a counterrevolutionary commander in the Don Basin where he would be killed in April 1918. Kornilov's fate, though, is much less interesting than the damage caused by Kerensky's handling of the episode. The Petrograd Soviet was called upon to oppose Kornilov's deployment to the capital. But, the only military assets they had were controlled by the Bolsheviks, who gained the authority from the Soviet to form a Red Guard. So Lenin's followers were given an opportunity to reverse their fading fortunes. They helped suppress the "coup", rehabilitating the Bolshevik's reputation, and gained a permanent presence. Trotsky would later write, "the army that rose against Kornilov was the army-to-be of the October Revolution." [*]"War is mainly a catalogue of blunders." When you come across a poem such as “To My Daughter Betty, The Gift of God” in Anne Powell’s anthology A Deep Cry, you can’t help being poignantly reminded of the book’s subtitle: First World War Soldier-Poets Killed in France and Flanders. Every poem in this 470-page anthology in a sense represents a great loss—of a man and of talent that might have produced so much more, as well as the loss of a father, husband, brother, or son. Sixty-six British poets are represented in this collection. Not only were they all killed on the Western Front, but all were already published poets. Some were aristocrats, some were working-class, and many were somewhere in between, but all help confirm that for the first time Britain was fielding an army possessing a high level of literacy. Some, such as Sergeant J.W. Streets or Captain E.F. Wilkinson, MC, may never have been heard of by most of us, while others such as Wilfred Owen or Charles Sorley are well known as war poets. In this remarkable book Powell presents each poet chronologically in order of their deaths and gives brief backgrounds of their lives, a description of the battle in which they died, and relevant excerpts from their letters and diaries. She also provides maps and lists of the cemeteries in which they lie (or the memorial on which they are named), all providing us with a touching picture of the poet as a human being. As we read through Powell’s collection, first published in 1993, we see evidence of the truth behind Paul Fussell’s claim in 1975 that the Oxford Book of English Verse “presides over the Great War in a way that has never been sufficiently appreciated .” So many of the poems in Powell’s book show the writers not only to be familiar with the best of English poetry through the ages but also quite willing to emulate, borrow from, and even caricaturize it. Medieval literature is echoed in a few short poems, while Shakespeare and Milton are reflected in several sonnets. One poet admits to writing in the style of Kipling while another parodies Yeats (“I will arise and go now, and go to Picardy,/ And a new trench-line hold there…”). A.E. Housman is present if only because an officer of the Royal Naval Division used blank pages in his copy of A Shropshire Lad to write some of his own work on. Happy once more in the midst of my kin. Fussell, Paul. The Great War and Modern Memory, OUP, 1975, p. 159. 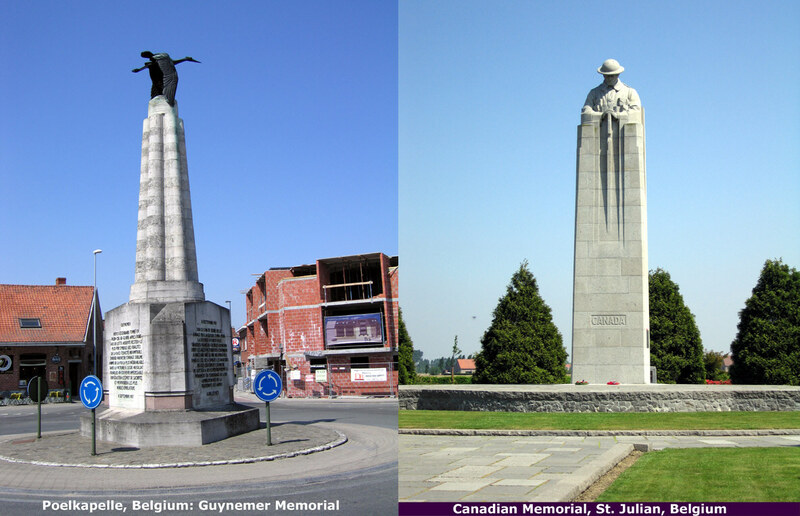 Both of these monuments are located north of the town of Ypres, Belgium. The stork (insignia of elite French aviators) on the left honors Georges Guynemer, who went missing near Poelkapelle in September 1917 during the Battle of Passchendaele. Just south at the village of St. Julian is the "Brooding Canadian" soldier, honoring the Canadian troops who held the line nearby during the first gas attack on the Western Front in April 1915. 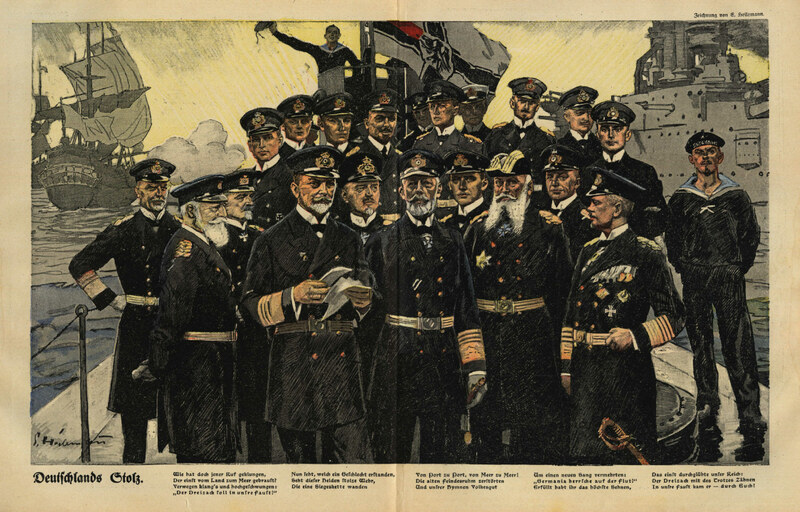 We stumbled across the image above, from a 1917 issue of the German magazine Lustig Blatter, that is obviously a tribute to the notable figures of the nation's navy. We could find, however, no identifying key for the figures. The editors contacted our friend and naval historian Steve McLaughlin for help. Steve plugged into his network of naval experts and below is what they have come up with. Comments are welcome, and there are a few identities that our panel were not fully confident about. In any case, thanks to Steve and his colleagues. Otto Weddigen, U-boat commander; famous for sinking the British armored cruisers Aboukir, Cressy , and Hogue on 22 September 1914 while in command of U-9. He was killed on 18 March 1915 while in command of U-29 — his boat was rammed by the battleship HMS Dreadnought — the only time that famous battleship was actually in action. Christian August Max Ahlmann Valentiner, third-highest-scoring U-boat commander of the First World War. Otto Hersing, U-boat commander, sank the British cruiser HMS Pathfinder on 5 September 1914, the first ship to be sunk by a submarine-launched, self-propelled torpedo. 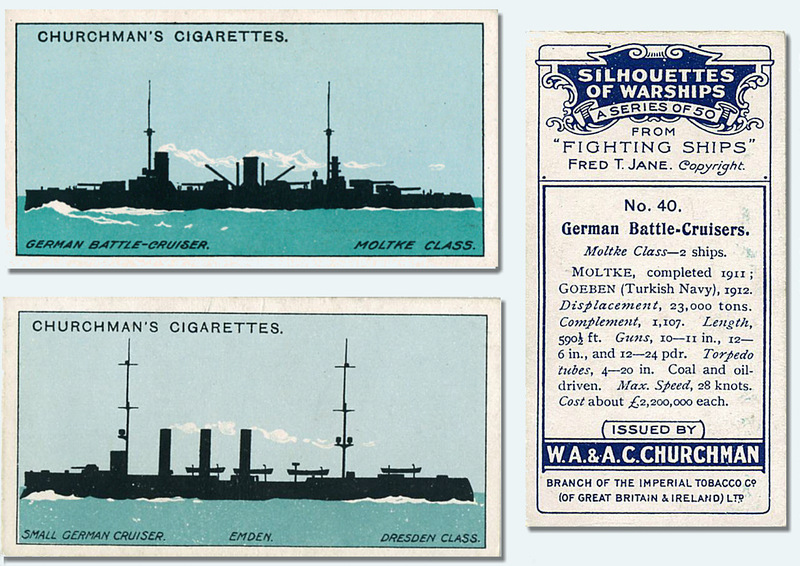 He went on to sink the pre-dreadnought battleships Triumph and Majestic off the Dardanelles in 1915. (?) Nikolaus zu Dohna-Schlodien, commander of the minelayer/commerce raider Möwe; one of her mines sank the British pre-dreadnought HMS Prince Edward VII. Karl Friedrich Max von Müller, captain of the famous light cruiser Emden. (?) Walter Schweiger, famous for sinking the Lusitania. Peter Strasser, commander of the naval Zeppelins during the war. (?) Walther Forstmann, another U-boat commander, the second most successful U-boat commander in terms of tonnage sunk. (?) The enlisted sailor is so conspicuous our advisers believe he must have done some exceptional deed, but no one could identify him. Our naval adviser Steve McLaughlin is a contributor to a comprehensive look at the navies of World War I to be released next month from Naval Institute Press, To Crown the Waves: The Great Navies of the First World War, which we will be reviewing soon in Roads. Maximilian von Spee, who should need no introduction! Henning von Holtzendorff, famous for writing the December 1916 memo to the Kaiser advocating the resumption of unrestricted U-boat warfare. Eduard von Capelle, who replaced Tirpitz as State Secretary for the Navy in March 1916; although initially opposed to unrestricted U-boat warfare, he eventually came to support it. Adolf von Trotha, Scheer’s chief of staff at the Battle of Jutland. 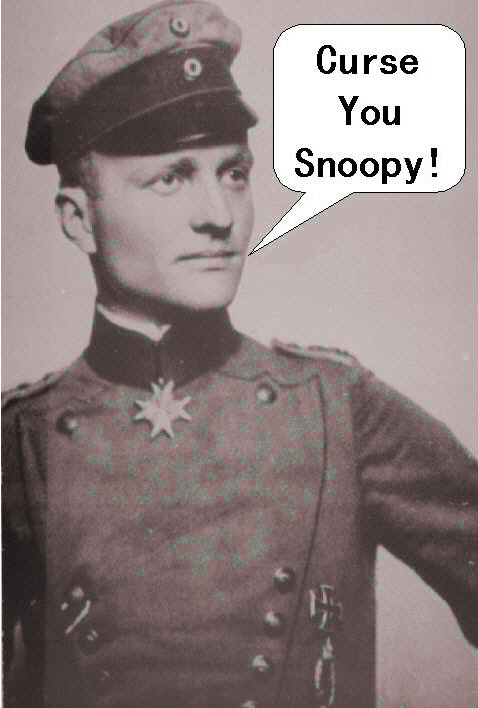 Franz Hipper, another officer who should need no introduction! Prinz Heinrich of Prussia, younger brother of the Kaiser and commander of German naval forces in the Baltic Sea. Erich Steinbrinck, commander of the torpedo boat (i.e., destroyer) V-29; he was killed at Jutland. Alfred von Tirpitz, another officer who needs no introduction. Lothar von Arnauld de la Perière, the most successful U-boat commander in terms of tonnage sunk. Reinhard Scheer, who was (or course!) the commander of the High Seas Fleet at Jutland. What Happened at Mousetrap Farm? All the major battlefields of the Western Front were the sites of multiple actions during the war, and of battles-within-battles. Nowhere is this more true than in the Ypres Salient. At 2:45 a.m. on 24 May, the Germans launched an attack on the Allied lines that involved the greatest use of chlorine gas to date, this time delivered with shells. The German gas came "drifting down wind in a solid bank some three miles in length and forty feet in depth, bleaching the grass, blighting the trees and leaving a broad scar of destruction behind it." Being a mere 30 yards from the enemy trenches the rapid occupation of the farm by the quick-moving German infantry was little short of inevitable. By 9:30 p.m., out of a battalion strength of 666 men, all that remained when the battalion "retired" was one officer and twenty other ranks. In just eighteen and three quarter hours, the Dublin Fusiliers had suffered a loss of 645 men who were blown to bits, gassed, or driven insane by the effects of poisonous gas. The 2nd Dublin's commanding officer, Lieutenant-Colonel Loveband, died the following day. The battalion did not take part in any more major battles for the rest of the year. Engraved on the Menin Gate Memorial are the names of 461 Royal Dublin Fusiliers killed during the Battles of Ypres. Of those names 143 belong to Dublin Fusiliers belonging to the 2nd Battalion who died on the 24th of May 1915. A. 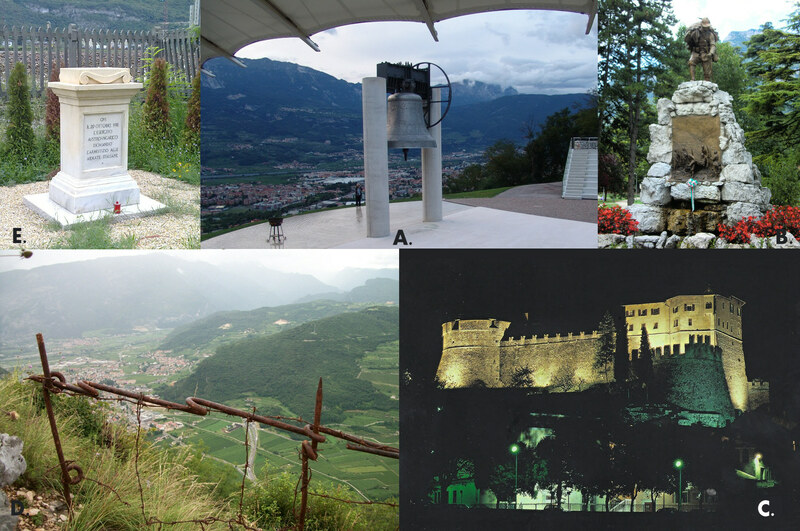 On Miraville Hill overlooking the city and the Adige River valley is the "Maria Dolens" bell. Made from the war's cannons, it tolls 100 times every evening at sundown in a ceremony that is the Italian Front's equivalent to the Last Post ceremony at the Menin Gate. B. In the center city is the national monument to Italy's elite mountain warriors, the Alpini, who bore the brunt of the "High War" in the surrounding mountains. C. Towering over the city's center is the Castello di Rovereto, which, since 1921, has housed Italy's national war museum, the Museo Storico Italiano della Guerra. The wonderful collection includes displays remembering all the participants in the Great War, unique items on the mountain war, and an especially good display of artillery pieces in an adjacent site. D. Above the city, accessible by auto and by (usually) short walks, are a number of trenches, observation posts, and artillery positions of both sides. Shown here is the view from the Austro-Hungarian fortified position at Nagia Grom on the opposite side of the river from Rovereto. E. Just south of the city is the marker commemorating the site where Austria-Hungary formally requested an armistice on 29 October 1918. 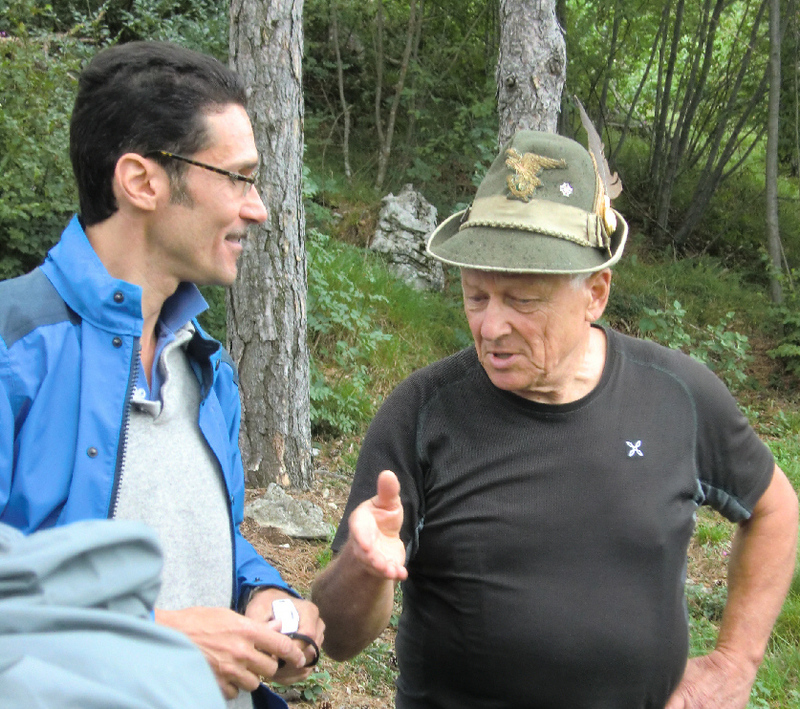 Thanks to Robbie Patriagni, who guided me on both my visits to Rovereto and Trento and helped make my 2011 Italian Front tour a success. 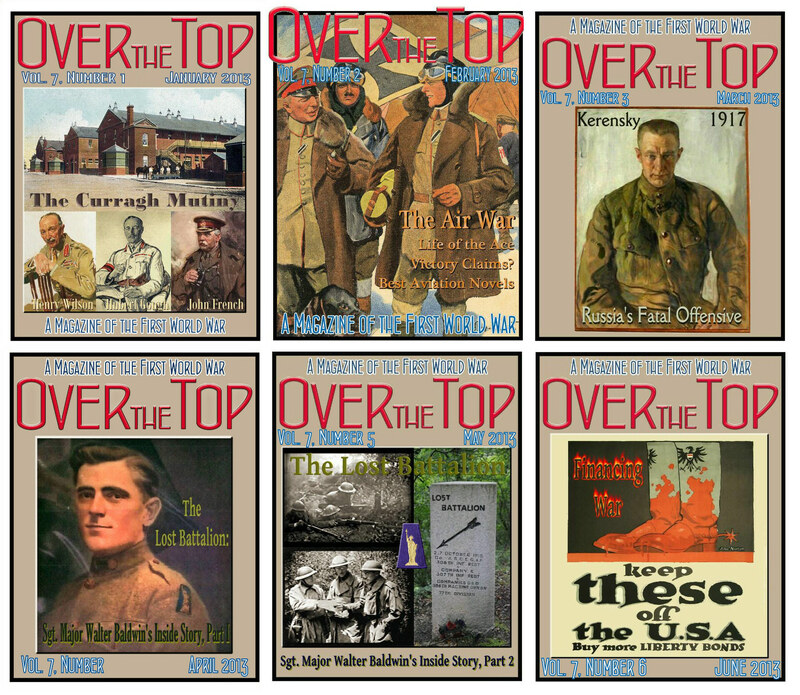 The staff of Roads to the Great War also produces a full-color, monthly subscription magazine titled Over the Top. Our first six issues for 2013 are pictured above. The cover stories and main features for the remainder of the year are on Douglas Haig–the Innovator; Forgotten War Poets; How Stretcher Bearers Became Combat Medics in the Great War; Centennial 2013: Europe on the Eve of War; Hemingway's Real War; and Recon V: The French and American Battlefields of the St. Mihiel Salient. Annual subscriptions are $25, annual compilations are available on CDs with many extras, and individual downloads of any of our 78 previous issues can be made for $4.50 each. Let's not forget that yesterday was National Doughnut Day, which was a WORLD WAR I commemoration when it was initiated in 1938. 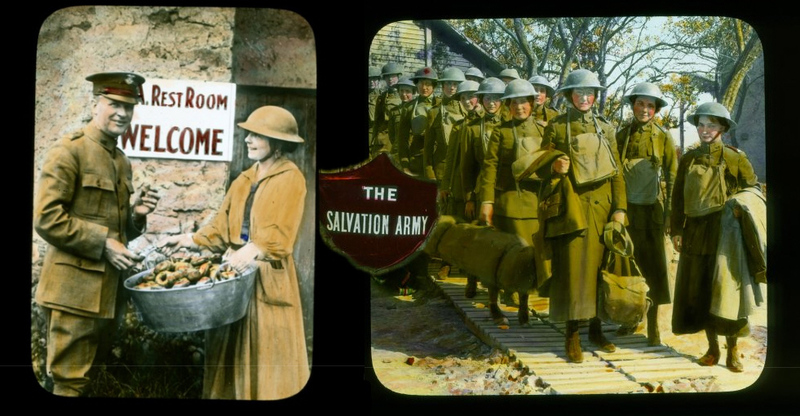 The celebration was intended to honor the women of the Salvation Army who not only served doughnuts to the Doughboys, but actually invented the modern doughnut that we still love. Read Doughnut: The Official Story (link) to learn the wonderful history of one of America's greatest contributions to world cuisine. Few people remember Joyce Kilmer. In a very random survey I asked some friends, all reasonably well educated and “of a certain age,” if they had heard of him and none had. One was sure I must be referring to a woman. All however were familiar with the lines “I think that I shall never see/A poem lovely as a tree.” This memory seems to be all that remains of an American journalist, editor, and poet who, born in 1886, enlisted in 1917 and as a sergeant in the 42nd Rainbow Division met sudden death at the Second Battle of the Marne from a sniper’s bullet through his forehead on July 30, 1918. He died by the Ourcq River, a stream in Picardy, and left behind him a wife and three children His comrades of the 42nd buried him by the side of the stream. We now know that the Lusitania also carried less innocent cargo besides “friendly men” and playing children serenaded by their mothers. This was not known in May of 1915, however, and the poem effectively conveys the sense of shock and injustice the sinking caused the American people, all intensified by the aura of grief and tragedy that emanates from the ghost ships. Duffy's War by Stephen Harris. The story of the Fighting 69th in the Great War, it is possibly the finest history of an AEF unit. There are many interesting connections between the D-Day invasion and the Great War. I thought we would share a few today on its 69th Anniversary. 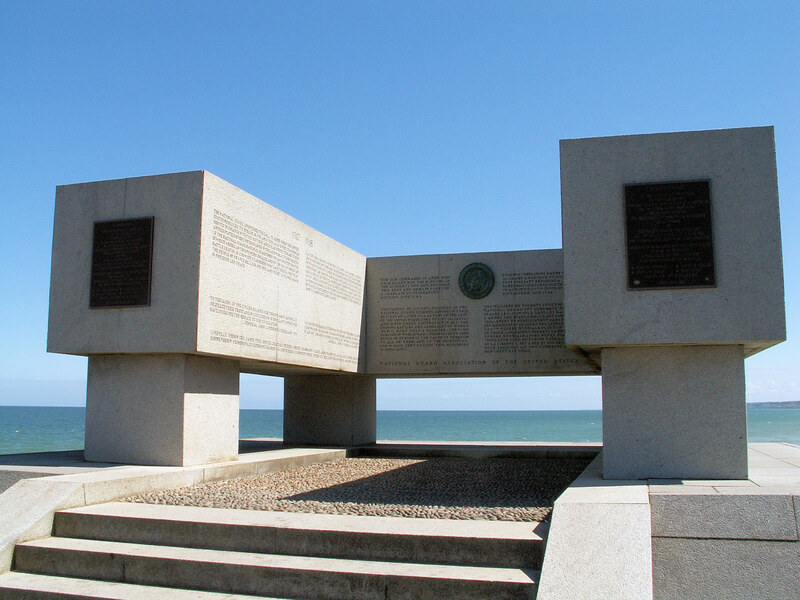 America's National Guard Memorial for both World Wars is located at the west end of Omaha Beach. That section of the beach was where the 29th Division landed on 6 June. This is the area featured in both Saving Private Ryan and The Longest Day (remember Robert Mitchum as General Norman Cotta?). It was also the place where the Bedford Boys met their fate. 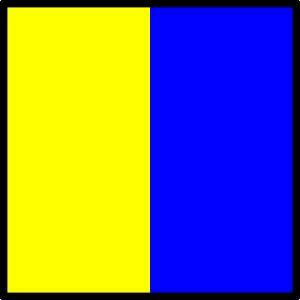 The 29th Division, a unit formed with National Guard troops from the Atlantic Coast region, also fought in the Meuse-Argonne Offensive of WWI. 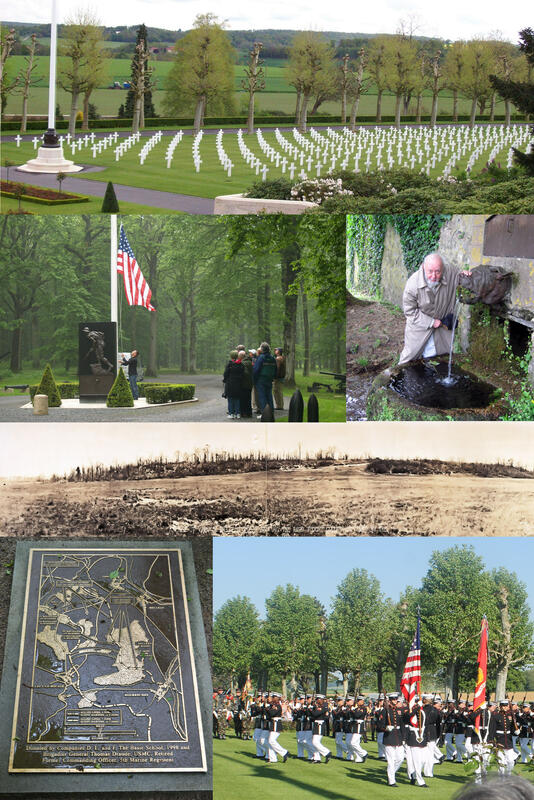 The distinguished service of the division in what are the most famous American battles of both World Wars contributed to the selection of this site as the National Guard's National Memorial. The large panel to the left on the photo above describes the contributions of the National Guard to the U.S. victory in WWI. Except for Dwight Eisenhower and Omar Bradley, almost every senior officer on both sides at Normandy had served at the fronts in the Great War. The most highly decorated of these, however, was Atlantic Wall commander Erwin Rommel. 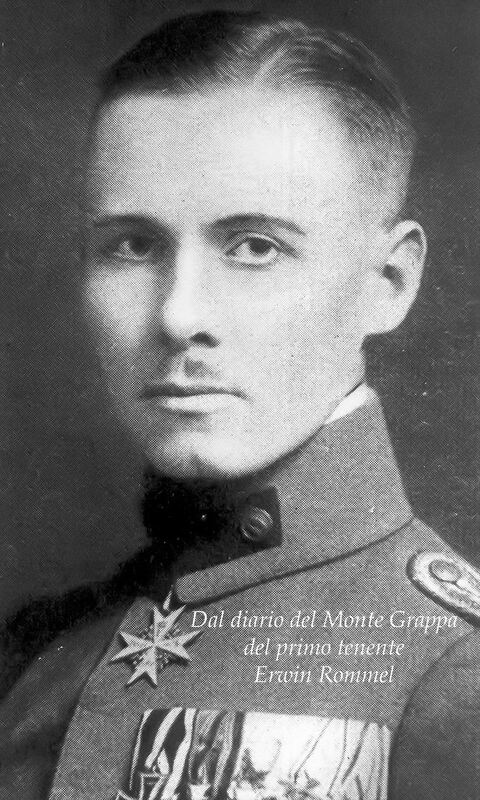 He is shown here wearing his Pour le Mérite, awarded for his service at Caporetto in 1917. Rommel's reputation as a general bounces up and down a bit, but if you are ever able to visit Caporetto and track his actions there, you will undoubtedly conclude he was one fantastic lieutenant. There is a single American who fell in the Great War buried at the Omaha Beach Cemetery with all the casualties of the 1944 campaign. It is President Theodore Roosevelt's son Quentin, a former Nieuport 28 pilot with the 95th Aero Squadron. He was shot down and killed in July 1918, then buried near his crash site. His brother, Theodore, Jr., died in 1944 from heart disease shortly after leading the initial assault on Utah Beach as the assistant commander of the 4th Division. At the family's request, Quentin was re-interred to lie in peace next to his brother. 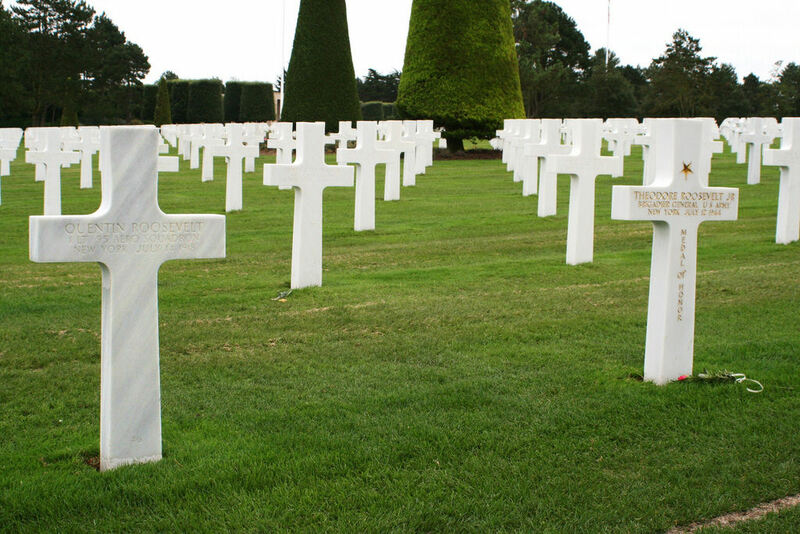 The gold star on Ted's grave indicates the Medal of Honor which he received for his actions at Normandy. Ted had also served with distinction and had been seriously wounded in World War I. 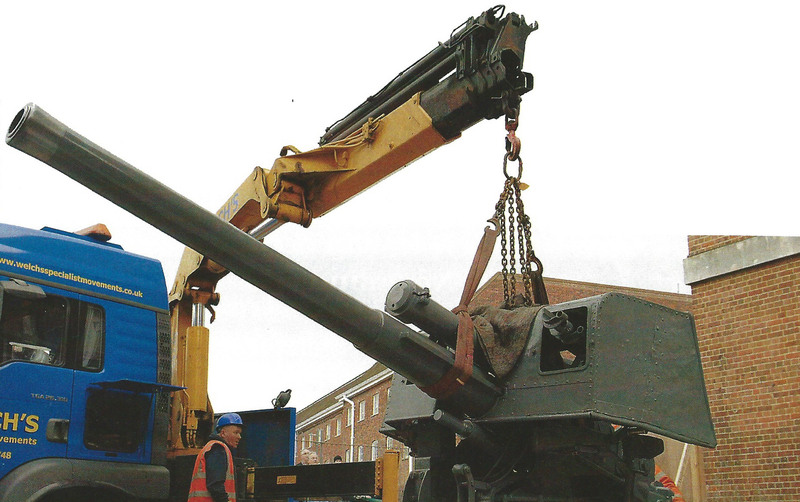 The naval gun and turret above, shown in transit between the Imperial War Museum and Portsmouth Historic Dockyard, fired the first shot in anger at sea in the Great War. It is a 4-inch Mk. IV piece capable of firing a 32-lb. shell over five miles. On 4 August 1914 it was mounted on the destroyer RMS Lance, part of a patrol off the Dutch coast that came across the German minesweeper Königin Luise. Failing to escape the speedier vessels, the German ship was scuttled by the crew. However, the next day, a mine the Königin Luise had laid sank the cruiser RMS Amphion, the first British ship to be sunk in the Great War. The war at sea was off and running. Written by P. (otherwise unidentified) and quoted in the highly entertaining and informative We Wasn't Pals: Canadian Poetry and Prose of the First World War; edited by Barry Callaghan, Bruce Meyer. Some of these entries are bit mysterious to the editor and we would appreciate some guidance from the readers. These include the identities of: Messrs. Lipsett, Mercer, Turner, and Dave Watson. Also, are the "Pats" the Princess Patricia's Light Infantry? And, whoever they are, why don't they advertise? The Soldier Lt. HRH Prince Maurice of Battenberg (1891-1914), the youngest grandchild of Queen Victoria and a first cousin to George V, died at Ypres on 27 October 1914. He was also a first cousin (twice removed) of the present Duke of Edinburgh. He served in the British Expeditionary Force in the 2nd Battalion, King's Royal Rifle Corps (cap badge shown above). At the First Battle of Ypres in 1914, the first battalion of the King's Royal Rifle Corps crossed from Zonnebeke to Broodseinde to stop the German infantry on the Keiberg. Prince Maurice was a lieutenant commanding the second division [?] of the battalion. As soon as all the troops had crossed, the enemy opened fire from their position on the Keiberg. The prince was mortally wounded by shrapnel and died on the field before his men could take him to safety. At Princess Beatrice's request, he was buried among his men in the Ypres Town Commonwealth War Graves Commission Cemetery. A monument dedicated to his memory was erected at the Royal Burial Grounds at Frogmore in 1917. His Outfit Originally raised in 1756 in the North American colonies to address the need for soldiers who understood forest warfare, this regiment went on to serve with distinction on the Peninsula, in India, and in South Africa. During the Great War 22 battalions were raised, quite a few considering that the regiment had no specific recruiting area and no Territorial battalions. Seven members of the KRRC won VCs during the war. After several combinations and amalgamations the heritage today is with The Rifles, which incorporates both rifles and light infantry. The badge has the light infantry bugle in the center and displays battle honors, as was customary for rifle formations, which had no colors due to their use as small, mobile units. The motto shown on the badge, "celer et audax" ("swift and bold") was a reference to the regiment's unconventional style of fighting. The Maltese Cross appears on most (but not all) British rifle formation badges. I don't know why. There are also a few examples of non-rifle units with the Maltese Cross. As we know, the U.S. Army and Marines use the Maltese Cross on their marksmanship awards. Chunuk Bair was the main objective of the troops deployed at the Anzac sector at Gallipoli in both April 1915, and during the later Suvla Bay operation of the following August. The summit was held briefly by New Zealanders who captured it on 8 August. They were relieved during the night of 9-10 August by two British battalions, which almost immediately succumbed to a massive counterattack launched by the Turkish commander, Mustafa Kemal. The New Zealanders now backing them up, however, stemmed the tide, preventing a rout. Chunuk Bair, though, was never captured again by the Allies, and the campaign eventually ended with an evacuation completed in January 1916. This 360 degree image at the ANZAC.GOVT.NZ website starts with a view of the Aegean, Suvla Bay and the Salt Lake in the distance, and then shows the Turkish trenches, and the summit with one of the numerous Mustafa Kemal monuments around Gallipoli and the New Zealand Memorial. Lufbery Marker Found, Hurrah for Reader ML!